This has been a really hard review to write; I’ve had to think a LOT about Citizen Kane and why I thought about it the way I did. I completely understand why the American Film Institute has crowned it the greatest American film of all-time, but that doesn’t stop me from feeling curiously cold every time I think of it. Citizen Kane is, without a doubt, a technological masterpiece — but there’s an emotional distance that keeps me from truly engaging with it. 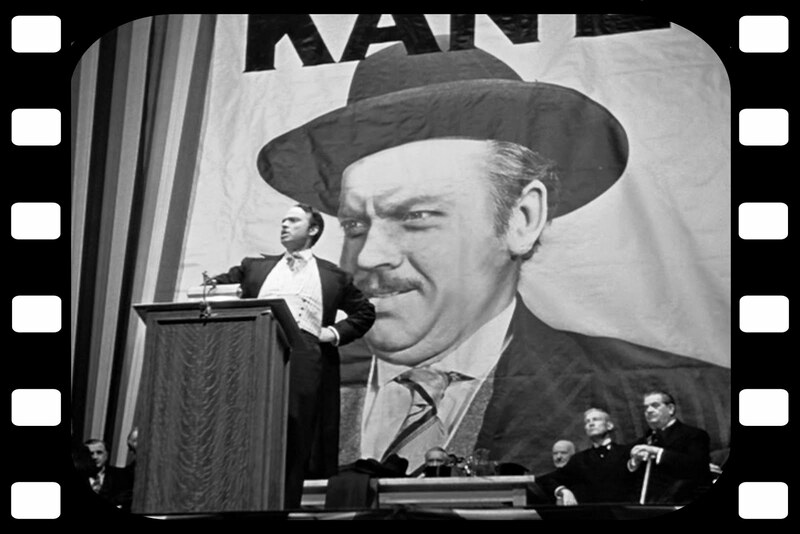 The film opens with the death of its protagonist, Charles Foster Kane. Alone in a tremendous mansion, he drops a snow globe and whispers the word “Rosebud” as it crashes to the ground. A newspaper reporter, curious about why the last word of such an important figure was so cryptic, tries to get to the bottom of the mystery. He interviews a number of friends, lovers and associates of Kane to get a feel of his life — and we learn about the man himself through the remembrances of the people he came into contact with. So much of what we have come to take for granted in modern cinema — time-bending narratives, montages that cleanly track the change of characters over long periods of time, cinematographic composition — came from this movie. It’s mind-boggling to think how many staples of American cinema were conjured out of whole cloth here. Credit where it’s due: Citizen Kane created an immense chunk of film history when it arrived. But maybe there’s something about its greatness that will always hold me at arm’s length from the work itself. Logically I know that what I’m seeing on the screen is genius, but it’s hard to be engaged by it. It feels like so much focus went into how the story was being told that the effect of the story suffers a bit for it. I don’t doubt that Orson Welles, as co-writer and director, told the story exactly the way he wanted to tell it. In fact, his fight for creative control of his vision is legendary. Every shot was constructed in an exacting fashion, and he went to great lengths to make sure the story unfolded on the screen with the pace he wanted. You have to admire the certainty of his vision, and the uncompromising nature of its realization. The central conceit — why did Kane say “Rosebud” with his dying words? — doesn’t quite provide me with enough motivation to care about the mystery being uncovered. Perhaps there’s a fundamental idea that I either don’t understand or don’t agree with, but the answer we’re given and its meaning fails to garner any sympathy or sense of tragedy from me, either. Kane lived the life that he chose to live, without sufficient self-awareness to know how he alienated everyone he had gotten close to. His circumstances were sad, sure — but you never get the sense that this weighed on him. When you come down to it, Kane is a man of naked, almost endless, ambition, and it doesn’t feel like there’s more to him. And the movie lives and dies on this outsized figure. Perhaps upon repeated viewings I’ll see him as more of a complicated, sympathetic and tragic character, but this time around it simply feels like he has these ideals that are incompatible with the reality he’s in. His stubborn refusal to accept things as they are leads him to his professional success. But it’s also devastating for his interpersonal relationships; he treats people with the same inflexibility that he does the institutions he’s fighting against. His friends and lovers crumble the same way the powers that be do under his persistence, but the end effect is a lot less admirable. Perhaps it’s the fact that he has this power — and it quickly corrupts him — that makes him less sympathetic than most. You never get a sense of the man behind the will, or at least attempts to humanize him don’t come across that well. From what I know of Welles himself, this makes sense. He, too, was a man of enormous ambition and drive. And what that got him was an institution of a film that deserves its accolades and historical regard. Personally, though, there’s just not a lot here to embrace. Even at number 2 on this list, I think this movie is underrated. This love story is unlike any other movie I’ve seen before or since, and I can see why so many people have fallen for it so hard. It has one of the best screenplays ever, featuring actors who are at the top of their game. There are no end of iconic moments and quotable lines, and even the ending is one of the most satisfying ever filmed. This is pretty much what a movie should be; perfectly executed in an artless, almost effortless way. Nothing touches Casablanca on that score. Bogey plays American expatriate Rick Blaine, a bitter man who owns a casino and nightclub that attracts a wide variety of clients. Vichy French, Italian and German officials rub elbows with displaced refugees desperate to get away from the threat of the Nazis — preferably the United States. Rick is a neutral party, and his Cafe Americain is a safe harbor for anyone who can pay for drink and/or games of chance. A petty crook shows up with letters of transit — papers that allow their bearer safe passage through Nazi-controlled Europe to neutral Portugal and her ports — planning to sell them at Rick’s club later that night. He’s arrested by Vichy Captain Louis Renault (Rains) before he gets the chance; he manages to leave them in Rick’s care before he’s pinched. An idealistic woman named Ilsa Lund (Bergman) follows the letters to the cafe, accompanied by her husband Victor Laszlo (Henreid). They need the letters so that Laszlo can continue his resistance work in America; Nazi officials in Casablanca are there to make sure he doesn’t make it out. Ilsa and Rick have a history that makes his decision a difficult one. Suddenly, he has to weigh the bitter disappointment of the past against a moral decision that carries severe consequences for him. Can he live down his anger towards Ilsa? Does he break his carefully-maintained stance of neutrality? What does he say to the various forces pressuring him to fall one way or the other? It’s a decision point that not only decides the fate of several people, but determines just what kind of man he is. It’s heady stuff, and it’s a delight to watch Rick work through it. The story alone is mesmerizing; Rick has to deal with an internal crisis while bearing incredible external pressure. The Nazis want him to do one thing, Ilsa wants him to do the opposite, and everyone from his frienemy Signor Ferrari (Sydney Greenstreet, who is just delightful) to corrupt cop Renault have their own ideas. He has to make peace with something he wasn’t remotely ready to tackle, forced out of his shell to engage in a conflict sweeping the rest of the world whether he wanted to or not. Bogart deftly shows us Rick’s broken soul through the cracks of his aloof, smart-alecky exterior. It’s truly extraordinary. The rest of the film is populated with amazing characters, from torn Ilsa to stoic, moral Laszlo to good-natured, long-suffering Sam. Even the extras bustle in the peripheries of the screen; scenes are established with snatches of dialogue we get from the patrons’ tables in Rick’s cafe. The film moves through dozens of stories to hone in on the one it wants to tell, but it never lets us forget that they’re there. The story seethes with the bits of its fellows encroaching on its borders, and sometimes (during the duel of the anthems, for example) all of them coalesce into a single shared moment. Behind the scenes, the shooting of Casablanca was fast and loose; I think this imparts an energy that you don’t see all the time with the polished Hollywood films of the 40s and 50s. The tales, true or not, of everything that went wrong with the movie and what the director and actors had to do to make things work just make me love it even more. To make something that looks so effortlessly great is no small feat — it’s even more impressive when the set is fighting you at every turn. If you haven’t seen Casablanca yet, do yourself a favor and watch it. No matter how many times its scenes have been spoofed, misquoted and imitated, there’s simply nothing like the original. Of the 100 films on this list, this is the one I would say is the greatest — which means I’ll have to talk about why I disagree with the AFI’s anointing of Citizen Kane. That’s an essay for another time. When Ryan and I were watching the AFI Top 100, we decided that it would probably be a good idea to save The Godfather Part II for review until we had seen the original. That way we get to see both halves of the story reasonably close to one another and we’re not forced to try and remember all the players and relationships for the sequel, because there are many. It was a good call; when you see this movie right after the original it feels like a natural extension — and completion — of the story. Here we see the moral degradation of our anti-hero Michael (Pacino) as he maintains and expands the empire of the Corleone family; through flashbacks we see how his father Vito (De Niro) built the Corleone name in the first place. Both men engage in acts of ruthless violence to protect their place in the society they find themselves in, and it’s hard to imagine how their grabs for power could have played any differently. The parallels are striking, and it really serves to highlight the differences between Michael and Vito. Back at the turn of the century, young Vito Andolini escapes Sicily after his entire family is killed for a slight to the Don committed by his father. He arrives in Ellis Island, is given the name Vito Corleone, and falls into crime as a youth after his meager job at a neighborhood grocery store is taken and given to the nephew of some Don. Through shrewd maneuvering he manages to take out this Don and gain control of the neighborhood. What’s interesting is what happens after that; Vito tries to look out for people who can’t look after themselves. He also goes back to Sicily to get revenge for his family. Even though slights are not forgotten, Vito conducts himself with something of a code — you give him the respect he feels he is due, and he can be a generous and loyal friend. By contrast, Michael pushes away his friends and allies. The only thing he really understands is working through fear and intimidation. The enemies of the Corleone family multiply from the previous film, grow bolder. Perhaps it’s his outsider’s status or just his natural temperament, but Michael simply doesn’t have the knack for managing people that Vito possessed, and it shows. An assassination attempt early in the film triggers a series of violent retributions both within and outside of the organization. By the end of the war, Michael — like Vito — is victorious, but his mastery comes at a far heavier price. The ending of The Godfather, Part II is a simple gut-punch that shows us just how far Michael has fallen from the principled youth at the beginning of Part I. The power he wields is absolute, and he has the mind to wield it effectively (if not subtly). But his circle of confidants has shrunken drastically, and the price of that power is something he realizes must be paid. Michael is an anti-hero done well; he has enough expertise that you have to admire him for what he’s able to pull off. He’s smart and competent, and principled enough that you empathize with him. It clearly hurts him to do what he does, but at the same time the position he’s in demands that he do it. You want nothing more for him than for him to find a way to get out of this with his relationships intact, but there’s simply no way for that to happen. His cold, mean anger is “earned” by the end of the movie — he’s been deeply hurt by various betrayals, and while it pains him to cut himself off from his support network it’s an understandable move. If anything this movie is even more epic than the original; Vito’s story gives it a weight and scope that definitely enriches the material. Just about everything that made Part I such a feat is present here, and stretched to see what else it can do. It’s a sequel that builds on what’s come before in just about every way — story, technique, the subtlety of the performances. Together, Parts I and II tell a wonderful American epic about the price of power and success, how the struggle to attain the American dream so often results in a hollow, meaningless victory. I have to recommend that you watch both of these movies, as close together as possible. They’re immense, ponderous, deep and sprawling. But they’re oh so very good. I liked this movie a bit more than Part I, but only because the stories benefit from what’s come before. 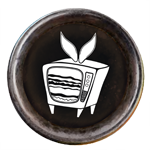 The work of being connected to the world of the Godfather has already been made; now we can really get our hands dirty, so to speak. When you see this film and consider what De Niro and Pacino have done since (say, Analyze This or Jack & Jill respectively) you can see why people scream bloody murder; how could minds responsible for these performances possibly think those movies were good ideas? It boggles. When I was but a wee leveret in the wilds of Baltimore City, I loved Gone With The Wind. This was a time before it (or anything) was readily available, so I waited for it to air on TNT every year. I’d watch it in two parts on weeknights, then in its entirety the following Sunday evening. It was something of a tradition for me. I got to the point where I knew entire stretches of the movie by heart. I was that big of a fan. I was really looking forward to seeing it as part of the AFI Top 100; it had been at least ten years since I watched it, even though I had seen it at least a dozen times. There’s always a sense of trepidation when you revisit a fond memory from your childhood. Does the story hold up as well as you thought it did? What little details do you notice now that flew over your head when you were younger? I know a lot more about slavery and the curious way Hollywood has approached the subject than I did back then; just how cringe-inducing would seemingly innocuous details seem to me now? The answer is very. Gone With The Wind is a deeply problematic film, and not just because of the way it asks us to think of slavery as “not that bad”. True, it engages in a bit of revisionist history, painting the antebellum South as something of an American Eden. But the issues go deeper than that, right down to the core of the story and its heroine, Scarlett O’Hara. I had always gone with the popular opinion of Scarlett — she was a Southern spitfire, full of flint and steel, able to take whatever came her way and make the best of it. But on watching the film this time, I have to say that I think she’s a sociopath. The movie is roughly four hours long, and a LOT happens in it, but the basic through-line is this. Scarlett O’Hara (Leigh) is one of the daughters of a wealthy Irish landowner in the South. Right around the time the Civil War is heating up, she’s set her sights on dashing Southern gentleman Ashley Wilkes (Howard). However, Ashley loves her neighbor Melanie (de Havilland) and they agree to get married just before every able-bodied man is called to fight. Through the troubled years of open rebellion, loss and reconstruction, Scarlett tries to survive, woo Ashley and resist the charms of scoundrel Rhett Butler (Gable). It’s a sweeping epic of a story with wonderful setpieces and so many memorable scenes. Rhett is a singular type of hero, complicated and contradictory, and you can’t help but feel that he should be throwing his affections after a better person than Scarlett. Throughout her life, Scarlett manipulates and cajoles men into doing what she wants them to do; she marries twice not for love but to spite someone and propel herself into a better financial position respectively, and she tries to get Ashley to run away with her while her entire family is depending on her and Melanie is recuperating from an extremely difficult birthing and a harrowing trip from Atlanta back to the O’Hara’s plantation. She has disdain for just about anyone that she doesn’t have a use for and only thinks of them once they can do something for her. Simply put, she is the worst. It’s actually a testament to the great charisma of Vivian Leigh that the character can be so reprehensible yet still engrossing. You find yourself caught up in her struggle despite her thoroughly amoral behavior, even if it’s because you hope the people she’s with make it through all right. Scarlett is caught between her dream of a romanticized life (Ashley) and the kind of life that she brings to herself through her actions (Rhett), yet both options feel simply too good for her; there are times where you really wonder if she’s even capable of love, or if her feelings for Ashley are some sort of self-serving reflex, or a passing desire taken root and amplified because it couldn’t be fulfilled. I know it seems like I’m coming across really harshly with Scarlett, but really…her lack of empathy knows no bounds. She whips a horse to death outside of Tara and feels not the slightest bit of remorse, immediately moving on to the house. When Melanie goes into labor during the fall of Atlanta, all she can think about is how inconvenient it is for her and her plans to get out of the city. She volunteers at a veteran’s hospital just to pass the time, and pretty much bolts as soon as she gets her fill. Later, she goes back to try and get the doctor to preside over Melanie’s birth, but only so that she can get it over with and leave the city before Sherman arrives. Everything is only considered by how much it affects her; she is thoroughly, consistently selfish. It’s astonishing. And her myopic, self-centered view of the world permeates the rest of the movie. Scarlett’s way of life is seen as idyllic, and the Northern interlopers who flood the sacked and razed land are only out to make a quick buck, hoodwinking naive and recently-freed slaves into serving their interests. The slaves themselves are either stupid and indolent (Prissy, as played by Butterfly McQueen), slow but completely content to serve their masters (field overseer Big Sam, as played by Everett Brown) or a caustic but doting servant (Hattie McDaniel’s Mammy — the role that made her the first African-American Oscar winner). There are some scenes that are shocking in their treatment of black people as little more than props — particularly one where a bunch of little girls are waving palm fronds over a bunch of sleeping belles. I realize when Gone With The Wind was made; in 1939, Hattie McDaniel couldn’t actually pretend the premiere in Atlanta due to the Jim Crow laws of the time. She couldn’t sit with the rest of her castmates during the Oscar ceremony where she won for Best Supporting Actress. She couldn’t even be buried in the Hollywood Cemetery upon her death more than a decade later because they wouldn’t accept black bodies. In a roundabout way, the movie actually helped galvanize the black community into speaking up about its representation (and treatment) in the entertainment industry and the whitewashing of history. In truly American fashion, Gone With The Wind provided a mixed blessing by being so tone-deaf about its subject matter. But it’s important to point out the image it bolstered at the time and how it informed the perception of the South for decades afterward. It holds up an idyllic, false image of a really ugly period of American history, and it holds up Scarlett O’Hara as its champion. She’s supposed to be the shining virtue of Southern pride — resourceful, proud and determined. But to me, she’s just cold, manipulative and selfish. I wish I could simply take the movie for what it is — a romantic epic that tells a great love story, populated with indelible characters and great dialogue. Gone With The Wind is certainly that. But I think we’re meant to identify with — maybe even admire — Scarlett, and that’s just asking too much. The movie does what it set out to do exceedingly well, and Clark Gable gives one of the all-time great performances for a dashing romantic lead. But the heart of the movie is rotten, there’s simply no way around that. Once you realize that, the rot pervades everything in it. Still, I highly recommend that you see Gone With The Wind. For better or worse, it’s a tremendous piece of our cinematic history. Just don’t confuse it for our actual history; you may end up coming away with the entirely wrong lessons. Have you seen Lawrence of Arabia? No? Well then, you should probably put down the Internet and go watch it as soon as possible. Because it’s the internet, this review will be waiting for you when you come back (though it might be a little defaced). Go forth, and educate yourself! Wasn’t that a *pretty* movie? With a very, VERY pretty main character? Full admission — I didn’t actually see a movie with Peter O’Toole in it until Venus, so it was quite shocking to know that he was pretty much a fairy sidhe back in the 60s. 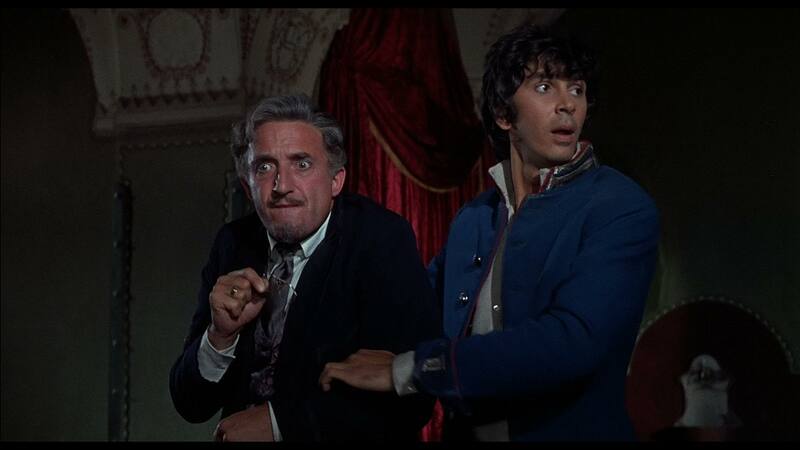 It was almost as bad as finding out that Frank Langella oozed jellicle-cat charm in The Seven Chairs. Hello, you handsome man (on the right, of course). Peter O’Toole brightens up the desert as T.E. Lawrence, an actual British army soldier who embedded himself with Arabian allies to take on the Turks during World War I. Lawrence begins his career as something of a misfit, disregarding authority and his colleagues alike until he’s sent on what’s essentially a diplomatic mission to assess the prospects of a British ally aiming to claim the Arabian peninsula for himself and his kin. Once out in the field, Lawrence finds a wily yet effective manner that allows him to take whatever comes his way and use it to his full advantage. There’s a surprising amount of grit in him, too; when it really counts, he digs deep to find a reserve of it so he can do what’s essentially impossible. It’s through these feats that he gains the respect of his Arabian hosts and eventually comes to be considered one of them. As Lawrence navigates the various groups he finds in the desert, he discovers a number of tribes that really don’t get along all that well. For different reasons they’ve been rumbling with each other for a very long time, and it’s only under his urging that they put aside their differences to combat the greater threat of the Turks. Maybe it’s for this reason (and subsequent military successes) that he comes to think of himself as something of a big deal for these guys. When he comes back to his British command post, it’s in traditional Arabian garb instead of his British uniform. The conversation he has with his superiors makes it clear that he’s flipped, and he’s representing the interests of the Arabians more than his home country’s. When he returns to the warfront he launches a number of guerilla attacks on the Turks. The attacks aren’t without their toll, and one particularly bad episode leaves Lawrence fundamentally shaken. He and a lieutenant are captured by the enemy and beaten, possibly molested. After that point, much of the fight has gone out of him — it’s only at the insistent urging of an ally that he pushes on to the big prize of Damascus. Once British interests are fulfilled and it’s clear that the Arabians may know how to take a city but no idea how to keep one, Lawrence is dispatched back to England. His destiny, for all intents and purposes, has been fulfilled. But what kind of destiny is that? Lawrence enters into the war a confident man just discovering the singular he abilities he possesses for success in it. When he leaves, he’s disillusioned, hollowed out and purged of any desire to touch those parts of himself again. There are a couple of episodes that force him to directly confront the violence of war, and both of these leave him disturbed. Interestingly, it’s not because he finds that violence distasteful — it’s because he loves it far too much. The movie touches on a few things that are really fascinating, but doesn’t get too deeply involved with them. Was Lawrence something of a sado-masochist? There are a few details in the film that establish a through-line suggesting so. How did his capture and torture change him? What exactly happened there? He was already beginning to tire of the toll that war takes on a person, but that single experience actually broke him in a very real way. I wish we could have explored that fallout in greater depth. But this isn’t really that kind of movie. It’s an epic of grand scale, full of massive set-pieces and intense, fascinating episodes that I don’t think I’ve seen in any other movie. This is the very first film that presents the desert as a thing of beauty — a harsh, austere one, but a beautiful landscape nonetheless. It offers us glimpses into the mindset of the people who call this place home, the various cultures that live there, the reasons why there hasn’t been a unified Arabia. What I find most impressive is that it does this without judgement or exoticization. The Arabians that Lawrence meets are flesh-and-blood people, not noble savages or Godless heathens. They have reasons for doing the things they do, an established perspective, and a code that they do their best to live by. In these highly-politicized times, it’s a really great thing to see. Director David Lean clearly knows how to establish a unique, lived-in world. His previous entries on this list (The Bridge on the River Kwai, Doctor Zhivago) are certainly a testament to that. Lawrence of Arabia is the most visually-striking of the three, because he sees how such a barren world can be attractive, worth fighting for — and he shows it to his audience quite well. Ultimately, Lawrence is disappointed in the outcome of his Arabian adventure precisely because these people are just like everyone else. They can be selfish, stubborn and uncompromising. It’s the very same traits that set him apart from his British colleagues, only manifested in a different way. I have a feeling that perhaps he thought there would be the chance to do something special during his travels through the peninsula; when his war turned out to be pretty much like the other war he left behind, that really took the wind out of him. But of course, my interest in the story lies with its people; this isn’t necessarily where Lawrence of Arabia shines. It is one of the finest (if not THE finest) epics put to film, set in a region that really sets it apart from anything else. It’s definitely worth seeing, for its cinematography and score for nothing else. Though O’Toole, Guinness and Sharif put in wonderful, magnetic performances, elevating the writing through their sheer charisma. Even though it doesn’t quite go to the places I’d really love to see, Lawrence of Arabia takes me to places I’d never be otherwise. 1939 was a very good year to Victor Fleming. He won an Academy Award for (co-)directing Margaret Mitchell’s southern epic Gone With the Wind, and helmed what’s arguably an even bigger cultural touchstone in The Wizard of Oz. This is the first portal fantasy committed to the screen that feels wholly American, from the dusty Kansas farm where the action takes place to the melting pot of fantastic influences that inform the crazy landscape of Oz. What’s interesting is that the fantasy suggests a country ill-at-ease with its coming industrialization and a slight distrust of the authority figures that feel bigger than life. Dorothy Gale (Garland) is a little kid who lives with her aunt and uncle on a farm in turn-of-the-century Kansas. After getting into trouble with her horrendously mean neighbor Miss Gulch, she runs away from home to save her dog Toto from being taken into the pound. On the road she meets a traveling fortune teller who uses a bunch of parlor tricks to make her believe her aunt will fall ill if she leaves home; Dorothy doesn’t quite trust him at first, but her concern for her aunt sends her running back to the farm. A tornado sends the Gales and their hired hands into the storm cellar, though, and Dorothy misses them. Forced to take shelter in her house, she’s knocked out by a window pane and transported to the magical land of Oz. There, she meets a number of folks all looking for the things they’re missing — while she misses home, the Scarecrow wants a brain, the Tin Man needs a heart, and the Cowardly Lion needs courage. They agree to help each other travel to the Emerald City, where they’ll meet the Wizard and have him grant them their wishes. Along the journey, each one of them (well, except Dorothy) display the very attributes they’re looking for; it’s really their self-image that needs correcting. Nonetheless, both Glinda the Good Witch and the Wizard demand that they take care of the Wicked Witch of the West, who wants to take Dorothy out anyway for killing her sister. Why does the Good Witch and the Wizard want Dorothy to handle their dirty work while they’re arguably more powerful than she is? Especially when they know that what Dorothy (and the Tin Man and the Scarecrow and the Lion) already possess the things they want most (or at least, have the power to attain them)? It’s a question that’s been asked or at least danced around, and some have even gone so far as to suggest Glinda is the true villain of the story. She suckers Dorothy into killing her rival, all the while knowing how to send Dorothy home. What’s her angle? And what are we supposed to make of it? I’m not entirely sure Baum meant for the Wizard and the Good Witch to come off as badly as they do if you think about what they’re doing even a little bit. Dorothy and her compatriots are simply willing to do the things that those in a position of power won’t because there’s motivation for them to do so. They’ve been tempted with their hearts’ desire, an ultimate goal that they’ve been working towards through the length of the movie — why wouldn’t they do anything they could to get it? The fact that they each display the qualities they believe they’re lacking is more for us than for them, a reminder that we often judge ourselves too harshly when it comes to our shortcomings. Regarding the film itself, it holds up remarkably well; I was quite impressed with the tornado sequence, which was tense enough to get my heart racing. The transition from sepia-toned Kansas to the technicolor world of Oz is stark and well-presented, though the set looks a *little* rickety these days. Even still, Dorothy’s three companions are wonderful; they sink into their roles with a vaudevillian’s physicality, and they’re so game in the performance that you’re willing to overlook the stitches and seams in their costumes to believe that they really are a man made of straw or tin, or a fearsome jungle beast who just happens to walk on two legs. And of course, Margaret Hamilton is perfectly awful as Miss Gulch and the Wicked Witch. She’s mean and revels in it; she provides Dorothy with just the right push to make her stumble into her heroism. While the story itself might not make much sense, and the costumes and sets are a little dated (but state-of-the-art for 1939 audiences), the emotional weight of the performances really take this movie over the top. Looking at the movie through a historian’s lens, I’m tempted to talk a lot more about what the patchwork of Oz’s fantasy means about us as a society. Is it possible that the reason the story took off is that it taught us to be self-reliant, that we have everything we’ve ever wanted already? It’d be a pretty powerful lesson in Depression-era America, where people all over the country were struggling to make do with less. And my eye is still drawn to the fundamental immorality of Glinda and the Wizard; it feels like there’s a subtext of government distrust there. It feels like Baum is warning us that the powers that be will take our needs and use them to manipulate us into reinforcing their position. It sounds crazy, right? But it’s not really even a new argument. There’s a lot out there about the potential political and religious subtext in The Wizard of Oz, though I’m not sure how much of that was implanted by Baum, known by the filmmakers or widely accepted by critics. Still, it’s fun to think that there’s this crazy world of meaning right beneath the surface. Whether or not you believe in the subtext, The Wizard of Oz is a great movie. The performances elevate the enterprise totally, and its impact on movie-making and fantasy in America cannot be understated. It’s neat that after all this time, there’s still nothing quite like it.